Many trails criss-cross the Middlesex Fells Reservation and offer a wide variety of scenery, distance, and difficulty. Find your next trail with the descriptions below. Get a free paper map when you join Friends of the Fells with paid membership. Membership has a lot more benefits than just getting the map – check out our calendar and join us on an adventure. The Skyline Trail follows the outer perimeter of the western Fells. There are spectacular views of Boston and the surrounding area. Most of the Skyline trail is in wooded landscape, with several steep ascents to rocky outcrops. A difficult hike. The Reservoir Trail encircles the north, middle and south reservoirs and the open water can be seen from many sites (the reservoirs are for drinking water, so access to them is prohibited). A moderate to difficult hike. The Nature Trail was developed by Winchester Trails. This organization has a nature pamphlet and a Teacher’s Manual describing plants, animals, insects and geology at 8 trail stations. An easy trail. Accessed from the Skyline trail this trail ascends through the woods to the base of Bear Hill Tower. You may climb the tower for scenic views. An easy hike. 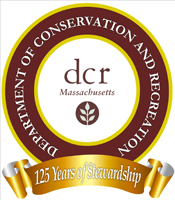 Beginning in the western Fells near the Medford High School, the Cross Fells Trail gives a good sampling of the features of the Reservation, from wetlands at Whitmore Brook to open water at Quarter Mile Pond in the eastern Fells, to views at Cairn Hill. Use caution crossing South Border Road, Route 28, Woodland Road and the Fellsway. A difficult hike. Skirting the edge of a wetland ail ascends Whip and Wamoset Hills and passes close to Crystal Spring. The trail connects to Virginia Wood Trail on the south side of Pond Street (use caution crossing). A moderate hike. This trail traverses Virginia Wood. One of the first parcels of private land given for public conservation purposes. The wood is also the site of the old mill town Haywardville (see next trail description). Virginia Wood Trail connects to the Rock Circuit Trail. An easy to moderate hike. The trail is marked one way beginning at the Recreation Headquarters at 4 Woodland Road. Visitors can walk the trail while referencing the self-guided trail brochure, describing 150 years of water-powered industry. An easy trail. 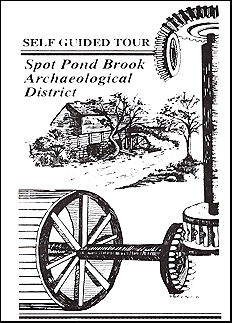 The Spot Pond Brook Trail Guide is available at the Recreation Headquarters or by clicking on the image to the right. Much of the trail traverses rocky outcrops in this corner of the park, providing a variety of scenic views. A difficult hike. Allows hikers to cut the Rock Circuit Trail in half. It runs between gate #51 of the Fellsway East and Rock Circuit Trail.